When we think about how to teach fractions, we should start at the beginning. What are the first concepts children need when learning about fractions, and how can we teach them in a meaningful, hands-on way? Follow along with my kindergartner’s introduction to fractions! To begin our fractions lesson, I started with a story. “Imagine that you and your brother finished breakfast and played outside all morning. You had so much fun digging and planting in the dirt that you forgot all about snack time. In fact, you were so busy you didn’t even hear me call for lunch. Next I pulled out a fun new book called Peg and Cat: The Pizza Problem. 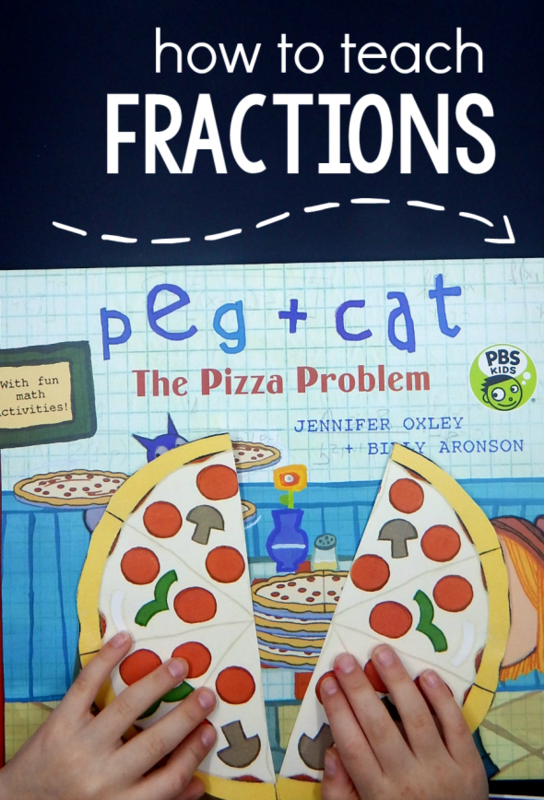 I’ve always loved introducing new math concepts with children’s literature, and this book does a great job simplifying the concept of fractions for preschoolers and kindergartners. 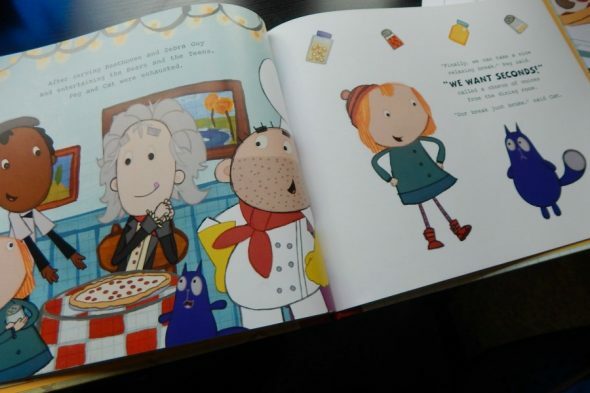 In the story, Peg and Cat have a pizza shop. The problem comes when one of their customers orders just “half a pie.” What is a half? My Five enjoyed the book’s entertaining story and silly characters, as did his younger brother (age four) who’d heard it before and wanted to be sure to hear it a second time. After we read the book and talked about it, I pulled out some paper pizzas and an ordering form that I’d printed from the book’s free teacher’s guide. I told my Five that his little brother, big sister and I were going to order pizza. Like Peg and Cat, he needed to take our orders. 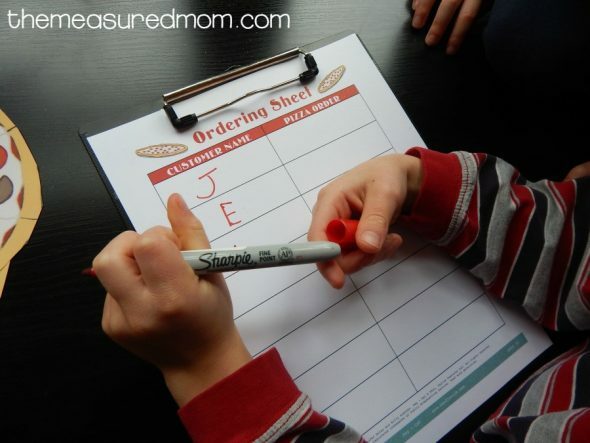 He wrote down our first initials and then came to the table, where my Four ordered a whole pizza, my Eight ordered 1 1/2 pizzas, and I ordered 2 1/2 pizzas. 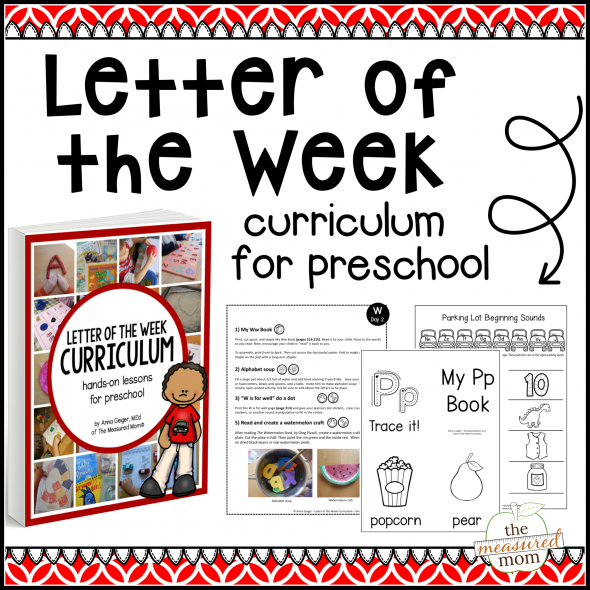 My Five drew circles and semicircles on the ordering form, as he’d learned from Peg and Cat. Next, he went back to the pizza kitchen (his desk), where he cut apart pizzas (also from the free teacher’s guide) and prepared our orders. Before moving to the next part of our lesson, I wanted to make sure that my Five understood that we can’t describe a part of something using fractions unless it’s divided into equal parts. My Eight had cut out some shapes for us. I cut some into equal parts and some into unequal parts. My Five glued them in the correct columns. Now that my Five understood the basic concepts of whole, half, and equal parts, we were ready for some basic fraction notation. I modeled how to write the fraction “1/2.” Then I invited my Five to write down other fractions. As I named each fraction, he wrote them down on sticky notes. Then I pulled out a graham cracker. I had broken it apart into four equal pieces (tip: use a knife instead of relying on the lines that are baked into the cracker, or you might have a cracker broken into many more than four parts…). 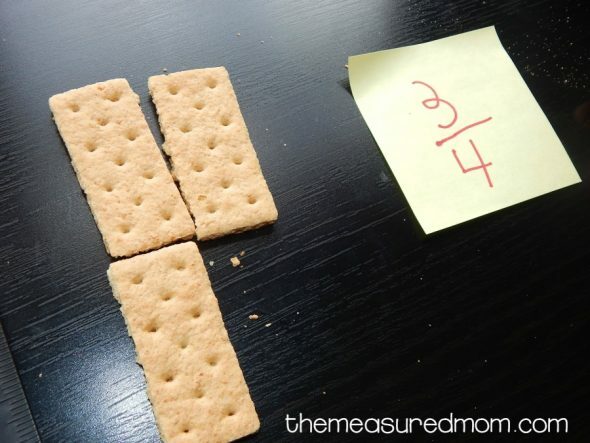 I removed a piece from the cracker and asked him to show the fraction which named how much was taken out. I helped him locate the note with “1/4” written on it. Then I pulled out some chocolate. 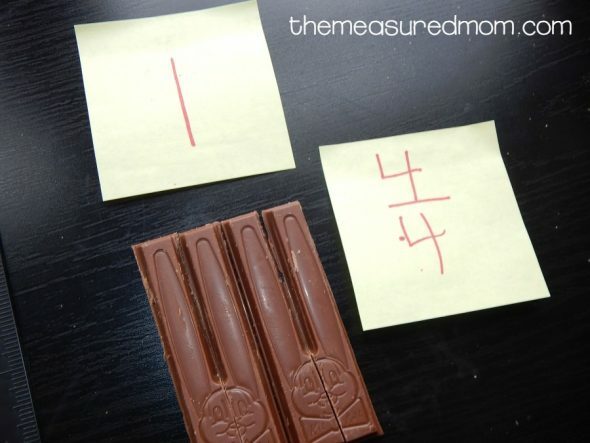 Because even though I don’t remember the teacher, grade, or even the school, I do remember learning fractions with a chocolate bar. 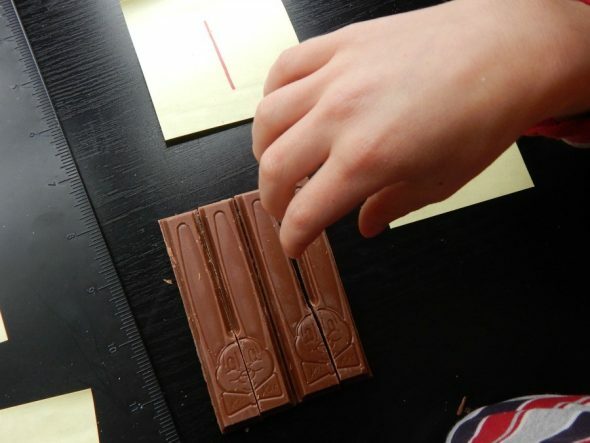 He put the pieces of the candy bar together to form one whole. After I showed him the numeral “1” I asked him to find a fraction that meant the same thing. After he located “4/4” I gave him a high five and told him he had found an equivalent fraction. By this time, the chocolate was calling his name. He took 1/4 for himself and distributed the remaining 3/4 to his siblings. And that’s what I call a successful, tasty introduction to fractions! 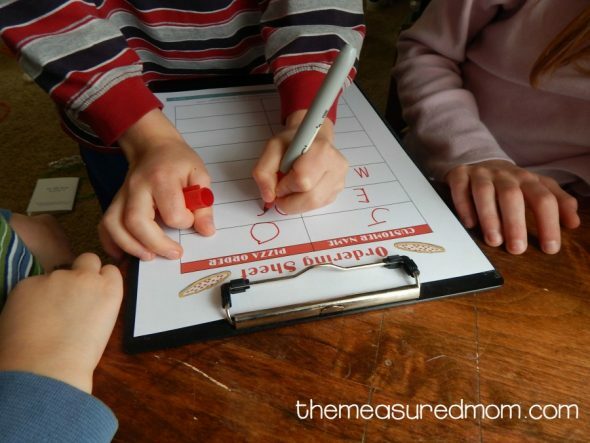 What are your tips for teaching fractions to kindergartners? Make pizzas out of paper. 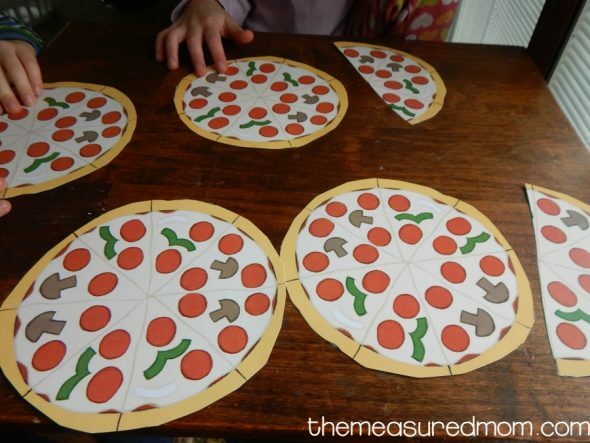 Have children cut the pizzas into equal sized pieces and label the back of each piece: 1/2 and 1/2 or 1/4, 1/4, 1/4, and 1/4. 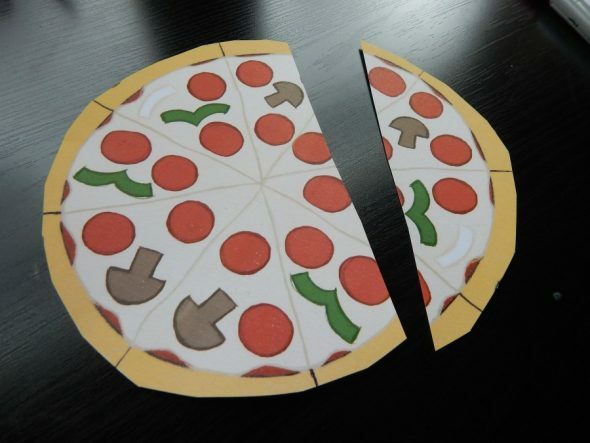 Make a paper pizza without adding the toppings. Draw lines to divide it into fourths. Then add paper toppings. Have your child make 1/4 with pepperoni, 1/4 with sausage, 1/4 with cheese, and 1/4 with anchovices. Or have him choose his own way to decorate equal parts of the pizza. Have a pizza party! Make mini pizzas out of English muffins. 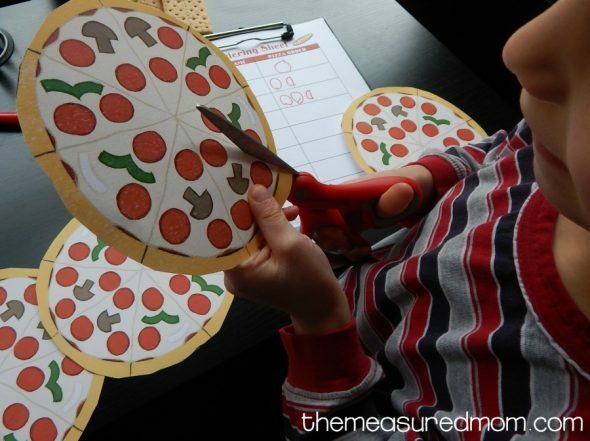 Give your child a child-safe pizza cutter to divide his pizza into equal pieces. 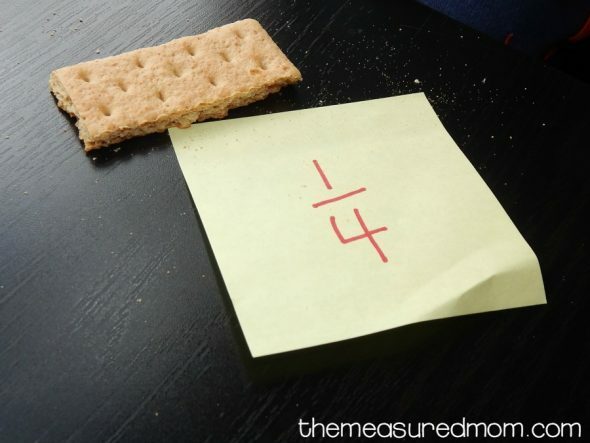 Encourage your child to think more about fractions. Would he rather have 1/2 or 1/8 of a pizza? Would he rather have 1/3 or 1/6? After hearing his answer, demonstrate what a piece of each size would look like. Does he want to change his answer? Experiment with equivalent fractions. How many different ways can you write 1/2? *This is a sponsored post on behalf of Candlewick Press. All opinions are mine! 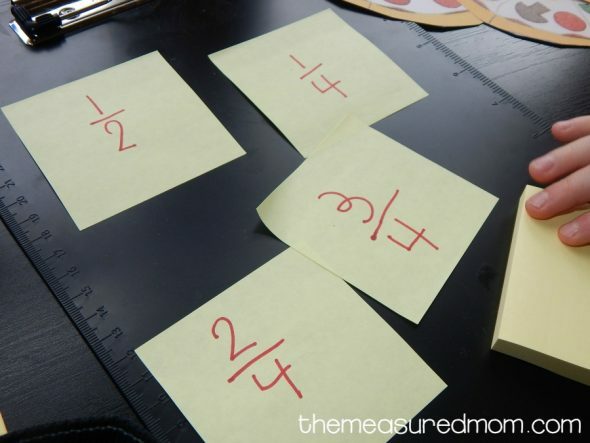 I enjoyed this post, and all your ideas for helping children learn the idea of fractions in a hands-on manner. The book also looks like one that would be attractive to young children. 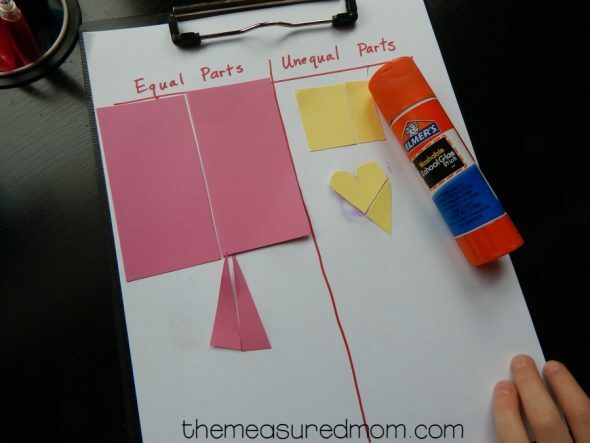 I would use these ideas for any age that was first experiencing the idea of fractions! Yes, I think these ideas could easily work up through second grade! Love love love peg and cat as does my five. I think he’d love the book! I’m so glad to hear that, Mari! I really liked your lesson! can you tell from which web you printed the pizza? I want to print it for my pupil and I cant find it. Then click on “download a teacher’s guide” in the left hand column.